Dove Top Products Review 2018: Dive Into Dove Today! That’s right, Dove has solutions for every kind of problem – regardless of your skin or hair type – so you know they’ll have something for you! Now, narrowing down a catalogue as diverse and vast as Dove’s into a top list is no easy task. Imagine trying to narrow down a list of your favorite songs, for example. It will inevitably vary depending on your age, mood, or any other number of factors – you might get a different list from one day to the next. Therefore, we at Maple Holistics have compiled our list with inclusivity and diversity in mind, much in the same vein as Dove conducts its business. Just like Dove encourages the idea of confidence and beauty at any size, Maple Holistics encourages product reviews at any size. Therefore, we’ve got something for everyone here in our Dove Top Products Review – enjoy! I know we were just preaching about our inclusiveness, so the follically challenged will need to forgive our kicking things off with a shampoo review. However, for those of you who are looking to find a new shampoo for daily usage, this review should prove quite helpful. Dove Daily Moisture Shampoo has everything you could possibly want out of your standard shampoo, and then some! Unlike most shampoos which can only claim to help your hair in the long term, Daily Moisture uses Dove’s Pro-Moisture Complex to get down to the hair’s cellular level. 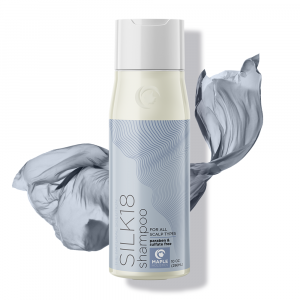 This allows the shampoo to provide a conditioning and strengthening wash that is virtually unmatched in other over-the-counter shampoos. Daily Moisture is 5-times stronger in one wash than your standard non-conditioning shampoo and is designed to not only provide a thorough washing, but to strengthen and condition hair in the long-term. If you’ve been dissatisfied with your current go-to shampoo, or if you’re just looking to upgrade to a shampoo that can actually help you build a stronger head of hair, look no further than Daily Moisture. Discussing personal care products and reviewing the Dove Beauty Bar is kind of like discussing fast foods and reviewing the Big Mac. That is, if the Big Mac were considered to be the class of the fast food world. The comparison is valid in that just like the Big Mac virtually transcends the fast food industry, in that everyone has had one and has an opinion about them, so too does the Dove Beauty Bar transcend the personal care products industry. 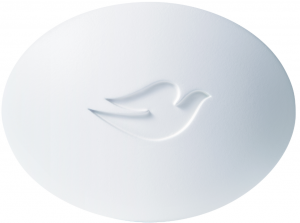 I have a hard time believing that there’s anyone out there whose skin hasn’t come into contact with this iconic dove-stamped bar – it’s the most popular soap bar on planet earth, and for good reason. However, that won’t stop us from discussing its benefits! By dedicating 1/4 of the bar formula to their patented Moisturizing Cream, Dove has created a bar that is virtually unmatched in its moisturizing capability. The ultra-mild formula features gentle cleansers as well, so you get a bar that not only moisturizes the skin, but gently cleans it. If you’ve somehow managed to avoid experiencing the Dove Beauty Bar over the course of your life, find out why it’s the #1 dermatologist-recommended bar in the world by trying one today – you won’t regret it. Originally we had intended to highlight a single exquisite Dove Spray Deodorant in this section, but the simple fact is that we found it too difficult to select just one! There are a number of fantastic options to choose from when it comes to Dove Spray Deodorants, all of which are designed to provide maximum protection. For starters, Dove Dry Spray Antiperspirant Clear Tone Skin Renew applies instantly dry and delivers 48-hours of protection from both odor and wetness. An accompanying light fragrance with violet, lilac, rose, and vanilla put Clear Tone over the top – max protection, instant dry application and a great scent – what could be better? 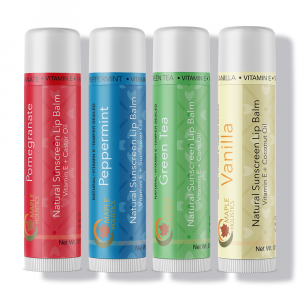 The deodorant is also available in Cucumber and Green Tea or Pomegranate and Lemon Verbena – or as unscented for those with sensitive skin. If you’re really afraid of those dreaded deodorant white marks, Dove offers Invisible Dry – a deodorant designed to keep from creating marks on even the most perceptible, mark-friendly clothing. Dove Silk Dry deodorant uses pure silk extracts in order to keep you extra-dry, and offers a great, silky scent in addition. 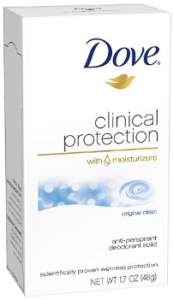 Finally, we have Dove Clinical Protection Deodorant with Moisturizers – a deodorant so strong that you’d think it was prescribed by a dermatologist. It isn’t a spray, but it needs to be highlighted for the sake of helping anyone with any need! Dove Clinical Protection is only recommended for those with a serious propensity to sweat from their underarms – most folks will be more than satisfied with the results of Dove’s non-clinical protection deodorants! Men care body and face bar. While all of the products we’ve highlighted until this point are not exclusive to women, they aren’t made with the specific needs and qualities of the male body in mind either. Luckily for men there is Dove Men Care, a line of products designed to provide personal care for a mans body, taking into account all of the characteristics of the male form and formulating accordingly. Take Dove Men Care Body and Face Bar, for example. The bar uses unique technology for men’s skin, utilizing moisturizing agents to keep skin hydrated and fresh, whereas other generic bars can dry out the skin. Meanwhile, Dove Men Care Body and Face Wash offers the same effects and benefits in a liquid package – if you’d prefer a body wash over a bar of soap. In the deodorant category we have the Dove Men Care Antiperspirant Deodorant Stick, which offers a powerful formula that protects against sweat and odor without damaging the skin – a combination that many other deodorant companies often struggle to achieve. In terms of hair wash, most men aren’t interested in owning more than just one product to do the job on their hair, which makes Dove Men Care 2-in-1 Shampoo and Conditioner such a convenient product! 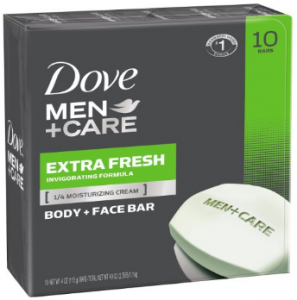 Finally, Dove Men Care Face Wash accommodates for the less-delicate nature of men’s facial skin by offering a formula that is designed to powerfully improve on skin health and appearance. Thus far we’ve almost exclusively devoted our list to deodorants and bathtime products. Now it’s time to find out what Dove can do for your skin outside of these contexts. Dry skin is a serious problem, and one that can lead to a host of others problems such as peeling, damaged skin, or eczema. That’s why Dove offers its Shea Butter Cream Oil Body Lotion – a delicious cream oil which utilizes a blend of ingredients to repair, smooth, and nourish skin. 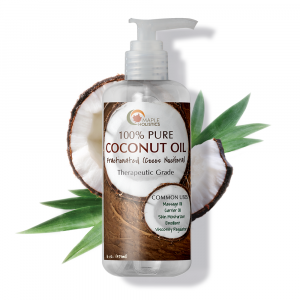 The cream oil and shea butter contained within the lotion penetrates deep into the skin, healing and repairing skin and softening in the process. Dove Body Lotion with Cream Oil and Shea Butter can be used as a ‘spot treatment’ in order to repair a particularly damaged or sensitive area of the skin. It can also be used as a daily or regimented skin treatment in order to help treat skin in the long term, promoting its health and appearance in the process. 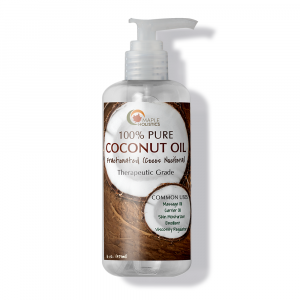 The body lotion is intended for use on the body but can also be used on the face if desired – with a versatile and effective lotion like this, you’ll find no shortage of potential uses. Dove prides itself on going above and beyond the call in terms of personal care, especially compared to other soap and body wash providers. This quality is perhaps seen strongest in Dove’s ‘Purely Pampering’ line of soap bars. Incorporating different exciting and indulgent ingredients, Dove’s Purely Pampering bars build on the original Dove Beauty Bar formula with new scents and qualities. 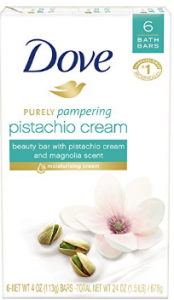 Dove Purely Pampering Beauty Bar Pistachio Cream with Magnolia, for example, uses pistachio cream and magnolia scent to create a bar that cares for and pampers the skin with an exciting scent and a gentle, effective formula. Dove Purely Pampering Beauty Bar Coconut Milk uses coconut milk and jasmine petals scent in order to provide a gentler, more specially scented effect. Additionally, we have Dove Purely Pampering Beauty Bar Sweet Cream and Peony and Dove Purely Pampering Beauty Bar Shea Butter to round out this excellent line of Dove bars. Looking for a way to clean and refresh your hair without actually getting it wet? Looking for an example of Dove’s innovative-ability? Look no further than Dove Refresh + Care Dry Shampoo. An example of a great innovation in personal care products period, Refresh + Care Dry is a spray-shampoo that is applied without water and still manages to effectively clean and treat hair. After just a few quick spray applications, Dove’s formula goes to work by using ingredients that absorb excess oil and then brushes out of your hair, leaving it in a cleaner, softer state. 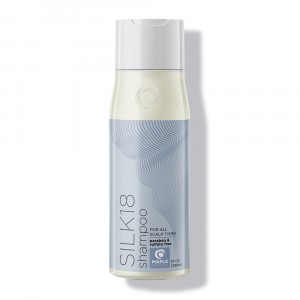 The spray offers a light, pleasant scent and can even be used on clean hair as a styling aid. Dove Refresh + Care Dry Shampoo is a great choice for folks looking for a way to clean their hair quickly and/or while on-the-go – pick up a bottle to complement your regular hair cleaning arsenal! Earlier we highlighted a Dove deodorant made specially for sensitive skin, and now it’s time to talk about a Dove Beauty Bar made specially for sensitive skin. 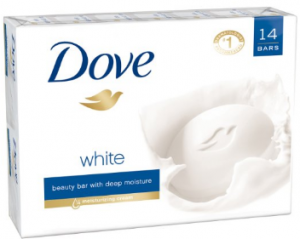 Unscented and hypoallergenic, Dove Beauty Bar for Sensitive Skin uses the same 1/4 moisturizing cream formula as your standard Dove Beauty Bar, but without any sort of ingredients or formulaic “extras” used for scent or other seemingly unnecessary qualities in your soap. That means you’re still getting the same great vital benefits as you would from your Dove Beauty Bar, but in a safer package.Essentially, if you’re looking for clean, moisturized skin but have skin that’s on the sensitive side, this is the bar for you. No, Dove’s Real Beauty campaign isn’t a product, but it still certainly deserves highlighting and reviewing here in this feature! One of the most successful ad campaigns of modern times, “Real Beauty” has not only managed to drive home its message of beauty and confidence at any size, body type, or look – it has managed to increase Dove brand awareness in the process. By using a series of advertisements, videos, workshops, and more (many of which have gone viral), Dove has been able to strike a chord around the beauty industry – one that encourages the celebration of the beauty found in all different kinds of women, and not just those who fit the traditional “beautiful” stereotypes and billing. Thanks for reading our Dove top products review – check out some of our other product features which have highlighted a number of brands, including Nivea, Olay. Neutrogena, Lush, and Urban Decay!